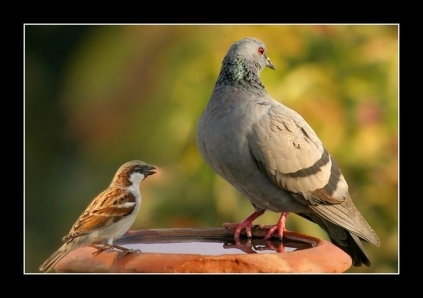 Did you witnessed any dishes (Bartan or برتن) wandering on the streets of Lahore yesterday? Whether it’s a Yes or No, it is an interesting promotional campaign by Unilever for their product Vim. The idea behind the campaign seems to be like dishes are protesting against grease. The campaign is actually an online Facebook based campaign where they claim to act like a News Channel featuring the news of much abused dishes that resides in our kitchen. The link to the Facebook page is http://www.facebook.com/BartanLive. The target audience seems to be females, especially housewives. I am not sure if they are running this campaign only on Facebook or if it’s also in main stream media. But if it’s only on Facebook, I doubt the real impact of this. Gunfire and explosions rocked Pakistan Navy’s PNS Mehran base in Karachi last night. Recent reports have confirmed at least 8 casualties and two aircrafts destroyed at the high security facility. P3 Orion aircrafts are operated by Pakistan Navy for maritime surveillance and reconnaissance missions. Navy has become the most targeted wing of the armed/security forces in Pakistan with four terrorist attacks spanning over the last two months. All four have taken place in Karachi targeting buses carrying Navy personnel and now an air-base. The first ever attack on naval interests in Pakistan during the current war on terror took place on March 4, 2008 when the Naval War College in Lahore was attacked by two suicide bombers killing at least 8 people. Our prayers and thoughts are with the affected families and friends of our brave military men who’ve lost their lives in this incident. Inna lillahe wa inna illehe rajioon. We all pray in unity for peace in Pakistan! 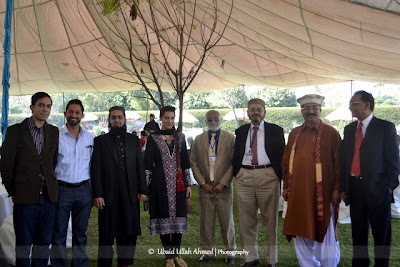 The Lahore School of Economics Seventh Annual Conference on the Management of the Pakistan Economy [May 4th, May 5, and May 6th] concluded at the Burki campus today. The theme of this year’s conference was “Financial Sector Development and Management’. The conference brought together a group of distinguished researchers and policymakers from across Pakistan and internationally. The underlying objective of the conference is to promote discussion on key policy issues in financial sector development and in macroeconomic management. 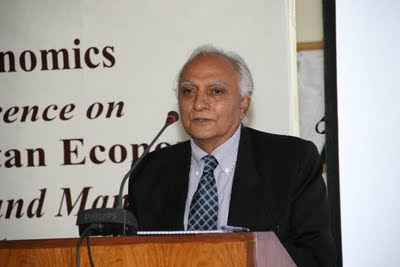 The conference was opened by Dr. Shahid Amjad Chaudhry, Rector Lahore School of Economics. Mr. Shahid Kardar, Governor State Bank of Pakistan will deliver the inaugural address. Researchers from PIDE, Quaid-e-Azam University, NUST, IBA Karachi, IBM Karachi, LUMS, Lahore School of Economics as well as a number of international universities participated in the conference. The conference span three days and consist of five sessions. The first session covered matters concerning macroeconomic management and the role and effectiveness of instruments of fiscal and monetary policies in controlling inflation while ensuring growth. The second session included papers that evaluate the impact of financial sector reforms on the efficiency and effectiveness of financial intermediation and in reducing financial repression. The issues of the linkages between financial sector performance and monetary policy were the focus of the third session, while capital markets, their governance and performance were discussed in the fourth session. The last session brought together a group of international academics to discuss development experiences in other growing countries and their relevance for Pakistan. “It is an island of tranquility only an hour away from home. It surprises me that so few people in Lahore or Kasur know of it. Such a place in India would have been swamped with visitors on weekends,” says Salman Rashid. Do you have any idea where? Read the story by Salman Rashid here. Better still go and discover it (Via). Do you know that you are at unnees (nineteen), and all you have to do is set up a process to take it to and keep it at bees (twenty)? Let’s hope this snooker club is based on a few processes rather than ‘daikhee jayae gee‘. Much like the rest of the Indian Sub-continent, Lahoris are bursting with adrenaline rush for ‘the’ clash between Pakistan and India. 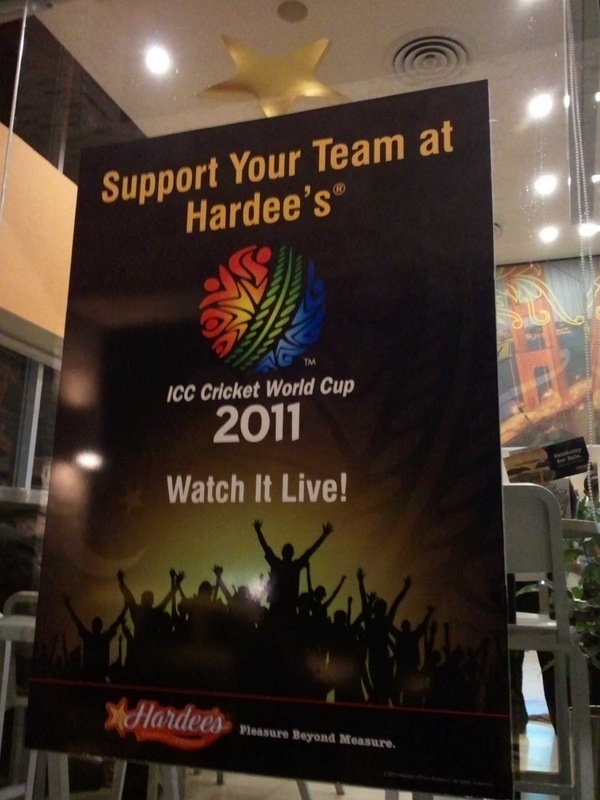 The South Asian arch-rivals will battle for a slot in the finals of ICC Cricket World Cup 2011 to meet Sri Lanka in Mumbai on April 02, 2011. What are Lahoris planning for the clash of the titans? Well, there is a mass-fever going on with projector screenings planned in public parks, open spaces, university campuses and even mohallas. Special arrangements are being done by corporates to entertain their employees with a company sponsored party. DHA Cinema and Cinestar both are selling over-priced tickets for the grand affair while all the happening eateries in Lahore including cafe’s, bistros, restaurants, hotels and even dhabas will play the match live from Mohali. Still, the majority of Lahoris will enjoy the match in comfortable confines of their homes with their close family and friends. Facebook and Twitter are already overloaded with over-optimistic, gladiatoristic rants and ‘naaras’ while the media on both sides of the border are buzzing in overdrive. Traffic is becoming a major issue for dwellers of this city of 10 million, especially for the vast majority of population that cannot afford to drive Corollas or fancy Range Rovers. The current Punjab Government has been epic in initiating unplanned, unreasonable and unjustified projects just for the sake of gaining mass publicity and a possible nod from the Western governments and donor agencies. Transparency and good governance are two important issues in which the Punjab government, according to some observers, was apparently faring better as compared to the center and other provinces. Any sane person from the general population, however, will highly disagree with this false notion when he still has to enjoy the effects of these supposedly successful initiatives. Urban planning is one important issue where each of our governments handsomely fails. The long-awaited Lahore Rapid Mass Transit system has almost been laid to rest while highly questionable strategy of road widening and tree cutting continues. Meaningless small stunts like construction of the Park n Ride plaza on Liberty Roundabout hardly have done anything to resolve the planning crisis and make our city more livable. The ugly structure, by the way, is hardly used by anyone and emits more carbon thanks to its free shuttle service to Liberty Market (located just a few hundred meters away) using diesel coaster buses. Pakistan has made a decent start to their World Cup campaign by first defeating Kenya by 205 runs and then toppling the Cup favorites, Sri Lanka, by 11 runs. Considering what we the fans had to go through last year, these two wins come as welcome relieve for us. However, going forward Pakistan think tank must make some changes in the team, or else we might not go too far in this tournament. As seen in the last game against Lanka, Pakistan is short of a specialist bowler at the moment. Wahab Riaz must be played in the team to strengthen the bowling. But the question is whom could he replace? Tough decisions will have to be taken, but I would drop Ahmed Shehzad and have Kamran Akmal open with Hafeez, followed by the usual batting order. Also, I feel like that Razzaq is being wasted at number 8. He should come to play at least with ten overs to spare so he could make an impact that he is so capable of. Also, he shouldn’t be opening the bowling. New ball should be shared by Wahab and Shoaib Akhtar. The mission of this team should not only be winning this World Cup, but also to restore some faith of its followers and the cricket fraternity in Pakistan cricket by playing some great-clean cricket. We can’t afford any more controversies and I sincerely hope that this team can maintain a positive image throughout this tournament. Go Team Pakistan! Those of you who keep a track of evolving e-shopping trends around the world must be aware of Groupon. ‘Groupon.com’ is an e-business that offers group discounts to users on it’s network of partner merchants. In easy words, shops and businesses register with Groupon and offer a group deal to customers. The group deal comes into effect only after a minimum number of customers sign up for it. Following the success of Groupon in the West and similar sites like SnapDeal in India, a Pakistani company Allainet has recently launched Groupin.pk. This platform is based on the principle of up to 90% discounts offered on group activities. For instance, if there’s a deal on Groupin.pk, you can get its alerts after an easy 3 step subscription process i.e. via email, Twitter, Facebook and SMS. Once you register for that deal, you’ll be issued with a coupon via either of these mentioned means. If successful, this model will create an interesting channel for merchants & small businesses to achieve scale and offer their products and services to a wider audience. In addition, more established businesses will also benefit by reaching out to customers by offering customized deals to specific segments. Groupin.pk is currently offering it’s services in Lahore, Karachi, Islamabad, Rawalpindi, Peshawar & Quetta. You can try it by registering at their website and get a chance to win an iPhone. A court in Pakistan has delayed a hearing to decide whether an American who shot dead two men in Lahore last month has diplomatic immunity. The arrest of Raymond Davis has severely damaged relations between the countries. Much of the detail in the case remains unclear – the BBC’s Syed Shoaib Hasan looks at some of the unanswered questions. Is Raymond Davis a diplomat? If you are thinking of a suavely dressed man in a three-piece suit who holds meetings with local officials to further or broaden his country’s agenda, you would be wrong. Mr Davis was definitely not employed for his diplomatic skills – he is more a “hands-on” person, working in what the US embassy says is its “administrative and technical affairs section”. Reports from the US say he is a former special forces soldier who left the military in 2003 and is working for the US embassy in Pakistan. As such, the US insists he is covered by the Vienna Convention which guarantees immunity from prosecution for all diplomatic staff. Could he be a spy? Many Pakistanis believe he is – there seem few other credible explanations as to why he was going around Lahore with a Glock pistol in a car with local number plates without informing local authorities. It is a requirement for embassy staff – especially those from Western embassies – to inform local police of their movements, simply because they are prime targets for militants in Pakistan. Mr Davis’s department in the US embassy is widely seen in Pakistan as a cover for Central Intelligence Agency (CIA) operations. Mr Davis himself said he was a consultant employed by the US government. Researchers in the US say that since leaving the military, Mr Davis worked for a security firm called Hyperion LLC. But subsequent investigations by the US media have now shown that Hyperion exists only as a website. The offices that the company says it has in Orlando have been vacant for several years and the numbers on its website are unlisted. Can Mr Davis be convicted for the murders? Maybe. It all depends on how eager the Pakistani authorities are to punish him. The fact that he is possibly a spy does not mean he is not covered by diplomatic immunity. It is common practice for intelligence services across the world to send operatives under the cover of assignments to embassies. Both Pakistani and US “diplomats” have been caught in such situations – and every time have been asked to leave the host country immediately with no possibility of a return. That is the maximum punishment that has been levied in the overwhelming majority of cases in countries which have signed the Vienna Convention. However, in some countries there are exceptions for serious offences committed, such as murder. Pakistan is one of those countries. The matter is now in the hands of the judiciary. But it is important to remember that Mr Davis has been charged with murder – the maximum sentence here is the death penalty. Should Mr Davis have been carrying a gun? Legally speaking, only Pakistani citizens with licences issued by the interior ministry are allowed to carry arms. No foreigner is allowed to carry arms, except soldiers or guards within the premises of an embassy. Both Pakistani nationals and foreigners caught carrying arms can be charged under a Pakistani criminal law which stipulates a jail term of six months to two years in addition to a fine. Mr Davis has also been charged under this law. Was he acting in self-defence? That was the initial plea made by Mr Davis and the US embassy. However, subsequent investigations by the police, forensic labs and the local and international media suggest that the two men were driving away from Mr Davis when they were shot. 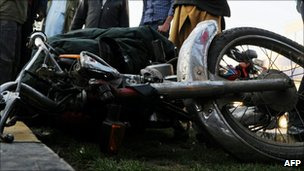 In February Lahore’s police chief said that Mr Davis was guilty of “cold-blooded murder” – he said that no fingerprints had been uncovered on the triggers of the pistols found on the bodies of the two men. Furthermore he said that tests had shown that the bullets remained in the magazines of their guns, not the chambers, suggesting they weren’t about to shoot him. On the face of it, this leaves Mr Davis’s claim that they were robbers – with one even apparently cocking a gun at his head – looking very thin. In addition, police say ballistics evidence shows that the pair were shot in the back – which again suggests they were moving away from Mr Davis, rather than about to attack him. 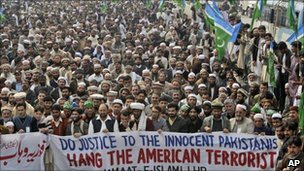 Who were the Pakistanis that Mr Davis shot? In his initial statement, Mr Davis said they were robbers who were trying to steal his valuables. He and the US embassy have maintained this story. However, the men have no criminal records as such. Both have been identified as residents of Lahore by the police. The pair were carrying licensed pistols – a fact which led many to believe they might indeed have been robbers. However, security sources in Lahore say that they were part-time or low-level operatives for the local intelligence services. Although reports are sketchy about what they were doing in relation to Mr Davis, security officials believe it could be the case of a surveillance operation gone horribly wrong. Pakistani intelligence services routinely tail and monitor all embassy staff, Western or otherwise. What about the second car and its victim? A side event to the main drama concerning Mr Davis was the fact a third man was also killed during the incident. He was an innocent bystander run over by a US embassy vehicle, which was initially said to have arrived to rescue Mr Davis. The fact that an embassy vehicle was able to get to the spot so quickly was a source of astonishment to anyone who is even vaguely aware of the geography of Lahore. Given the incident was over within minutes, it seems incredible that anyone could negotiate the 12km (7.4-mile) 40-minute drive in peak traffic in less than five minutes. But subsequent investigations have now shown that the second car – a Toyota Landcruiser – was with Mr Davis at the time of the incident. In fact, according to eyewitnesses, Mr Davis was leading and clearing the way for the Toyota when the incident took place. In the light of what happened afterwards, it seems Mr Davis was in “protective mode” and opened fire to “secure” whoever or whatever was in the Toyota – the interior of this vehicle was not visible as its windows were tinted. It is evident in local TV footage that the second vehicle is going away from Mr Davis at the time of the incident. As it disappears into the dust, Mr Davis calmly pulls over and gives himself up. Pakistani authorities have asked for the Landcruiser and its driver to be handed over – a request with which the US has yet to comply. 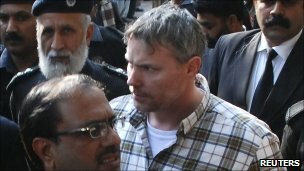 As well as public pressure, US officials have also privately warned Pakistan’s government of far-reaching and severe consequences if Mr Davis is convicted. Unnamed US officials have also used the media to issue veiled warnings to Pakistan that diplomatic ties could be cut and all aid stopped. Despite Islamabad’s public stance on Mr Davis, Pakistani officials are said to have privately assured Washington that he will eventually be released. However, public pressure means that at the moment this could lead to a massive anti-government backlash. Pakistan’s Prime Minister, Yousuf Raza Gilani, has hinted that blood money could be paid to the families of the two men Mr Davis admits shooting, which could enable his release. There is speculation that US officials may try to establish contacts with the families in this regard. However, it is not clear that Mr Davis has been charged under laws which would allow blood money to be paid. February 16, 2011 marked 12 Rabi ul Awwal – the birthday of Prophet Muhammad (PBUH); an occasion that is celebrated all across the Islamic World. The celebrations of the day include holding of mehfil-e-milaad at various locations across major cities and towns in Pakistan. Important landmarks and public buildings are decorated with buntings and lights while people distribute sweets to their neighbors, friends and family. 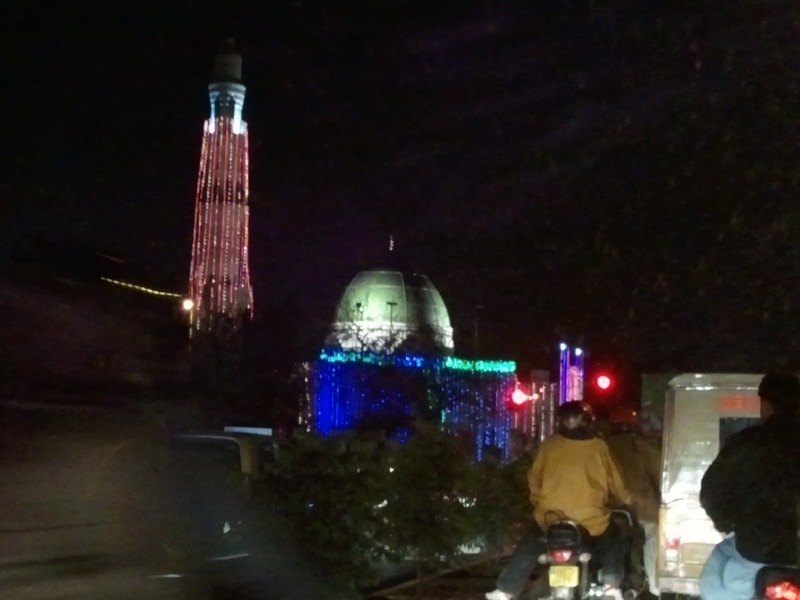 In Lahore, masjids and other important buildings were illuminated beautifully to celebrate the occasion and rallies were held to celebrate the Prophet Muhammad (PBUH)’s arrival in this world. Security was on high alert in order to avoid any untoward incident and the day passed happily and peacefully. Firefighters and locals are trying hard to put out a massive fire near Mochi Gate in Old Lahore. The fire, which reportedly broke out at a perfumery shop, has spread around a vast area gutting other shops, houses and a masjid. A lonely helicopter has been sighted throwing water from a distant height.